Among aficionados of the girl group sound, there can't be five acts more beloved than the Crystals. Their best-known songs, which include "He's a Rebel," "Uptown," "Da Doo Ron Ron," "Then He Kissed Me," and "There's No Other Like My Baby," are among the finest examples of the best that American rock & roll had to offer in the period before the British Invasion; and decades into the CD era, the group's records are still prized in their original vinyl pressings even by non-collectors, who seem to recognize that there was something special about the Crystals' work. The group was originally a quintet consisting of Barbara Alston (born 1945), Dee Dee Kennibrew (born 1945), Mary Thomas (born 1946), Patricia Wright, and Myrna Gerrard, organized by Benny Wells while they were still in high school. All of whom had started out singing in churches; Barbara Alston was Wells' niece, and although she later became known as their lead singer on many of their records, Alston was actually recruited as a backup singer by her uncle. Under Wells' guidance, they began performing in more of a pop vein, and one of the gigs that they got was cutting demos for the publisher Hill & Range, which brought them to the Brill Building in midtown Manhattan. It was there, while they were rehearsing, that they chanced to be heard by Phil Spector, who at that time was just starting up his own label, Philles Records. He was in the market for new talent and the Crystals -- who, by that time, had lost Gerrard and added La La Brooks to their lineup as lead singer -- were just what he was looking for, sort of. He liked their sound and their range, but he didn't initially like Brooks' voice and insisted on Alston taking the lead, somewhat reluctantly on her part. In September of 1961, the slightly reconfigured group cut their first hit, "There's No Other Like My Baby," which rose to number 20 nationally. It was a promising beginning, putting the group, Spector, and his new label on the map; although another song cut at about the same time, "Oh, Yeah, Maybe, Baby" (which featured Patricia Wright on lead), pointed the way to the group's future, with its understated yet boldly played string accompaniment. 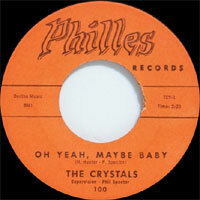 In early 1962, the Crystals recorded a Barry Mann/Cynthia Weil song called "Uptown," using an arrangement that was a tiny bit lighter on the percussion (except for castanets, of which it had many) but pushed the guitar and the strings out in front more than "Oh Yeah, Maybe, Baby" had. Barbara Alston's strong-yet-sensuous Vocalss enunciated lyrics that were as steeped in topical subject matter, especially about the frustrations of life in the ghetto, as they were in romance. This gave "Uptown" a subtly two-pronged appeall; it was a gorgeous pop record, but also a new kind of pop record, eminently listenable yet serious in its subtext. No, it wasn't "Blowin' in the Wind," but it seemed to evoke a social realism that heretofore eluded the pop charts. "Uptown" reached number 13 nationally. Its production marked a major step forward in the making of rock & roll singles in its production, and heralded a newer, bolder era in pop music and R&B, very much of a piece with such hits as the Drifters' "Up On the Roof," but with an undercurrent of frustration that the latter song lacked; it all pointed the way toward the more sophisticated and socially conscious kind of songs that Sam Cooke would soon be generating. 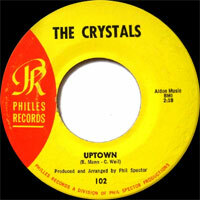 It was at this point, in the wake of "Uptown," that the history of the Crystals gets a little more complicated. It wasn't until June of 1962 that they had another single ready to go, and it engendered all kinds of problems that "Uptown" had avoided. If that song had gotten a serious lyric across with an elegant and quietly passionate setting, "He Hit Me (It Felt Like a Kiss)" (co-authored by Carole King and Gerry Goffin, no less) was the reverse, presenting a disturbing lyric about infidelity and the physical abuse of a woman by a man, in a dark, ominous manner. Barbara Alston and company gave it everything they had, and Spector came up with a surprisingly subtle, bolero-like arrangement, but it was a lost cause. Radio stations simply wouldn't play it, and the public didn't like the song, period; according to Barbara Alston, the group didn't like it either, and to this day nobody understands exactly what was in Spector's mind when he cajoled them into cutting it. The following month, Spector was back in the studio running another Crystals session, except that this time it wasn't really the Crystals that he was recording, but Darlene Love. 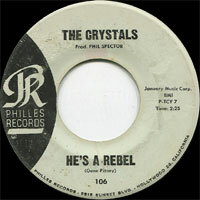 As the owner of the Crystals' name and, as their producer, possessing the right to record anyone he wanted (or anything he wanted) and label it as being from "the Crystals," he decided to forego any further battles over who should sing lead, and forego using the group entirely for "He's a Rebel." A celebration of street-level machismo like no other, it was an upbeat number with gorgeous hooks and, with none of the baggage of its failed predecessor, became a number one hit, as well as engraining itself in pop culture history as a quintessential girl group classic. Darlene Love was the lead singer on the next hit by "the Crystals," "He's Sure the Boy I Love," as well. It wasn't until early 1963 that the group again sang on one of their own records, "Da Doo Ron Ron," and by that time, Spector had accepted La La Brooks in lieu of Alston as lead singer. That record rose to number three in America and became their second biggest British hit, reaching the number five spot in the U.K. That placement, along with the U.K. number two position for "Then He Kissed Me" (which also got to number six in America), was very important, because at the time a lot of major British bands were about to break onto the charts at home, before coming to dominate American music a year later. "Da Doo Ron Ron" and "Then He Kissed Me" became among the most popular American rock & roll songs of the period in England, covered by all manner of acts on-stage and on-record. The Crystals were in a seemingly enviable position, except for the fact that they and Spector were increasingly at odds over what he was doing with them. They'd been unhappy from the time when Spector began using their name on behalf of records made by Darlene Love, and every time they were obliged to perform those songs on-stage it grated against them, and in 1963 they were almost constantly touring and performing. By 1964, they also perceived Spector's growing inattention; he had lately discovered a girl trio called the Ronettes on whose music and lead singer, Veronica Bennett, he was lavishing ever more of his time and energy. Meanwhile, the Crystals were making good and interesting songs, such as the beautiful "Another Country, Another World," "Please Hurt Me," and "Look in My Eyes," the latter a bluesy ballad that showed a side of their sound that Spector seldom tried to explore. The group had released two LPs hooked around their major hits, Twist Uptown and He's a Rebel, in 1962 and 1963, respectively, that had some good songs on them, but Spector's attention and enthusiasm was increasingly directed elsewhere. Spector's seeming dismissive attitude toward the group may have been best illustrated by the most bizarre record with which he, the group, his label, or almost anyone else in the music business had ever been associated: "(Let's Dance) The Screw." Spector had never been one to keep business partners very long -- in that regard, he was a lot like the movie mogul Samuel Goldwyn -- and in 1964, he'd settled a lawsuit against Lester Sill, the man with whom he'd started the Philles label. As a parting shot at Sill -- and, it is rumored, to fulfill the terms of a settlement that required him to pay a share of the proceeds from the next Crystals single -- he devised an otherwise un-releasable single that Philles pressed, called "(Let's Dance) The Screw." 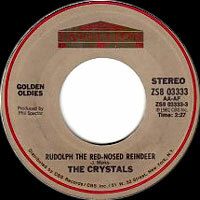 On it, Spector talked the lyrics while the Crystals sang backup, in a five-minute musical joke that is also one of the rarest records of the 1960s (supposedly only a handful were ever produced, one of which was sent to Sill). 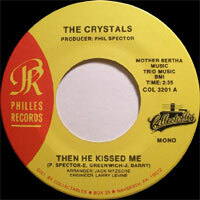 Personal jokes by their producer were all well and good, but by 1964, following the failure of two consecutive genuine Crystals singles, the group -- with Frances Collins replacing Patricia Wright -- was no longer interested in working with Spector. 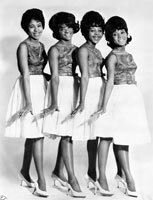 The following year they bought out their contract and headed to the seemingly greener pastures of the Imperial label, where they found no success; by that time, the only girl groups that were still competitive in the music marketplace were associated with Motown. By 1966, the Crystals had disbanded, and for five years no one heard anything about the group except in airplay on oldies stations. Spector had even closed down Philles Records, and the resulting unavailability of their records except on the radio only raised the value of the old copies that were out there, and made his periodic reissues of the group's work that much more prized by fans. Then, in 1971, with the rock & roll revival in full swing, the groupmembers reunited and spent a few years delighting audiences on the oldies circuit. Various incarnations of the group resurfaced every so often in the late '70s and 1980s, but at the dawn of the 21st century, Dee Dee Kennibrew was still leading a version of the group and had even managed to get them recorded. 1981 SP PAVILLION AE7 1354 (US) (promo) .